Asparagus is a perennial vegetable, which means that once you plant asparagus crowns they will produce (if cared for) spears for 10 to 15 years without re-planting. Choose an out of the way spot to plant your spears. If you have a small space, plant asparagus crowns on the north side of your garden so they will not shade out other vegetables. Choose 1-year-old certified disease-free crowns for planting in your garden. Remove weeds and grass from the planting bed, before working the soil. This is the most important step in preparing your asparagus bed, which should be in full sun with loose soil. Perennial weeds can quickly turn an asparagus bed into an impenetrable mess. Till to a depth of 8 to 10 inches to loosen the soil. Spread a 3- to 4-inch layer of organic matter such as compost or well-rotted manure on top of the loosened soil. Till the organic matter into the top 8 inches of soil. Test the soil pH. 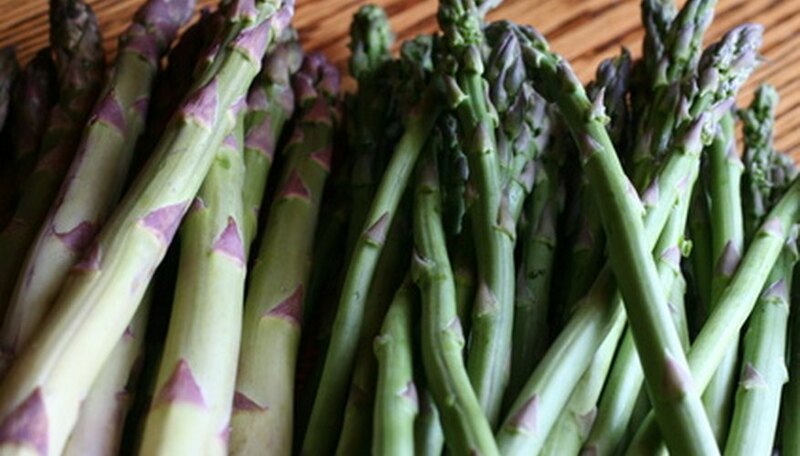 The ideal soil pH for asparagus is 6.5 to 7.0. Adjust the pH if necessary by applying lime (calcium carbonate) if too acidic, or sulfur if it is too alkaline. Dig a furrow 8 inches deep and 10 inches wide. Apply super phosphate (0-20-0) according to package directions along the bottom of the furrow. Cover the super phosphate with 1 to 2 inches of soil. Space asparagus crowns 1 1/2 feet apart along the furrow. Spread the roots out as you place each crown in the furrow. If you plant more than one row of asparagus crowns, space rows 4 to 5 feet apart. Fertilize the asparagus bed in early spring before spears appear with a balanced 10-10-10 or 12-12-12 organic or commercial fertilizer. Fertilize again in early fall (September or October). Apply 1 pound of fertilizer for every 100 square feet. Work the fertilizer into the top 1 to 2 inches of soil. Be sure not to disturb the asparagus crowns as you do this. Cover the asparagus crowns with 2 inches of soil. As growth emerges, cover it with additional soil until the furrow is completely filled. It will take a week from planting for the first growth to emerge. Water the asparagus bed with 1 inch of water a week during the growing season (March or April through September or October). Remember to count any rain received as part of the water. Apply 2 to 3 inches of organic mulch, such as straw or grass clippings, to the asparagus bed after the asparagus is 3 to 4 inches high. Keep the asparagus bed mulched year round to discourage weeds. Replace or refresh the mulch every spring when you fertilize the beds. Prepare the asparagus bed the fall before spring planting. Plant asparagus crowns in early spring when daytime temperatures are above 50 degrees F.
Choose all male crowns like the Jersey series for more spears per crown. Female crowns also produce flowers and berries which limits their ability to produce spears. Allow asparagus plants to mature for two years before harvest. The first harvest will be the third year after planting. Choose spears that are thicker than your finger and 6 to 7 inches tall for harvest. Spindly spears (thinner than your finger) should be allowed to mature into fronds. Leave asparagus fronds intact until they turn brown in late fall or early winter. Cut the fronds back to soil level in late winter or early spring. Leaving the fronds intact over winter is an easy way to provide winter protection to the crowns. You must allow some of the asparagus spears to mature into fronds if you want your asparagus bed to stay productive. The fronds make the energy (photosynthesis) the crowns need to grow and survive the winter. Always clean dead fronds from the planting bed in late winter or early spring. Asparagus beetles will overwinter in the dead fronds. If the fronds are not removed the beetles will lay eggs on the emerging spears making them inedible.